Easing the use of TYPO3 Flow for Ember.js based web applications. This is a Google Summer of Code project that will be implemented during summer 2013. Work in progress. Feedback is highly appreciated. Follow our Twitter account for progress updates. Go from FLOW domain models to a web app that uses FLOW as backend and Ember.js as frontend LIGHTNING FAST! Provide a loose coupling of TYPO3 Flow domain models and Ember data models through conventions. 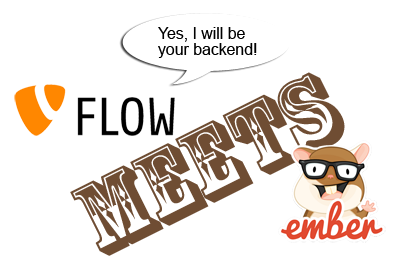 Provide a FLOW REST API (controller, view, route part) that complies to the Ember conventions. kickstart Ember models from Flow model semantics. kickstart Ember controllers, views, handlebar templates for a basic ember-based user interface. In order to provide a concise overview, I have created a diagram showing the components that a kickstarted application will consist of. Components that are kickstarted (generated) are illustrated with a green background. Components that are provided through a Flow package (cf. below Ember Commons Package) or are part of ember-data are illustrated with a blue background. How to define which model should be kickstared? What to do if there is an association to an additional model? Probably just omit, as in explicit declaration we can assume that it was left out intentionally. I think there currently is no API to retrieve all domain models of a given package name. If possible, providing a ignore list would be reasonable. Generally remove the long namespaces of the flow models. Problem: What if there is a model with the same name from a different namespace/package? Note: The naming decision also affects the names of routes to which ember tries to persist the models. Thus, it is connected to how the route part handles/forwards requests. As illustrated in the architectural overview the Flow RestController communicates with the Ember RestAdapter via AJAX calls in JSON format. Note: Once, json-api has settled to a stable concensus, the REST API should be evolved to comply to json-api. Handlebars is the templating engine used by Ember.js. Handlebar code can be defined in a script-tag directly in the html code or seperatly in a file. Handlebar templates can be precompiled which increases performance dramatically and additionally the precompiler runtime code of the handlebar library does not have to be loaded. Handlebars code should be outsourced into seperate files to allow precompilation => clean seperation and mixing TYPO3 FLUID and handlebars syntax problems avoided. Consequence: Fluid not useable inside Handlebar Templates => Does not make much sense anyway! Could use Flows FileMonitor to watch models and trigger automatic regeneration? Could use Flows FileMonitor to watch templates and trigger automatic precompilation? Should use composer for dependency management! The mentor Rens Admiraal has already started a project that solves some of the challenges that this project is tackeling. Thus, it is desireable that what is described above as "Ember Commons" package is an enhancement of the existing project.